Olly Masters has built a rep as one of New Zealand’s finest winemakers and wine judges. He's made jaw-dropping wines for the world-famous Ata Rangi and Misha's Vineyard. Olly’s secret for turning the world’s trickiest grape into liquid gold. He’s a genius. He’s got more degrees than a thermometer, and has spent 30 years making world-class kit in Hawke’s Bay, Burgundy, and Martinborough. This is as classy a drop of Pinot as you’ll get your gums round all year. Pure elegance in a glass. With juicy berries and damson plums, dark chocolate, liquorice and spice, and a long lingering finish. For sheer drinkability it's hard to go past young Pinot Noirs from the fresh coastal air of the south island of New Zealand. I made this wine to try and encapsulate that and provide a look for those who live a long way from a unique place. Dark and vibrant in the glass with strong fruit presence. Berries and plums sit beside a light oak touch for support. Ripe, with fleshy texture this is great drinking for any occasion and happily stands up to meals of all shapes and sizes! And because YOUR Angel funding paid for the grapes - you get it for a complete steal! Waipara Pinot Noir can offer so much complexity and savoury elements whilst still showing a very real New world fruit aspect. I reckon Waipara is producing some of the top Pinot Noir to come out of the new world and I get a great buzz out of a being a part of it! Dark ruby red in the glass the wine leads with abundant dark cherry, dried herb with a background of florals. Long, fresh and woven together with mineral tannins and French oak, this a wine that will equally age or enjoyed young. An array of ripe dark cherries, plum and berry fruits provides flesh and weight in the mouth - beautiful drinking and especially with a meal and some friends! After the roaring success of their first Pinot Noir, we challenged Bill & Claudia to make us an extra-special reserve batch. We reckon this is their best yet. Named after their baby daughter Penelope, this reserve used the best fruit and had a little extra Small & Small love added. If you're looking for amazing quality Pinot, then look no further. 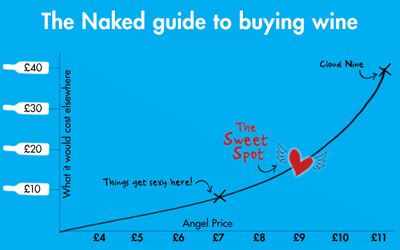 And because it was made possible by our Naked Angels - it's a complete steal! Mike was the genius behind the iconic Jackson Estate for 10 years, where he was head winemaker. A magnet for awards and Parker Points, his bold, fruity Sauvignons go gangbusters with Angels. As a side hobby he loves going toe to toe with the world’s best, making spectacular parcels of what he calls his ‘desert island’ wines and this is one of those beauties.